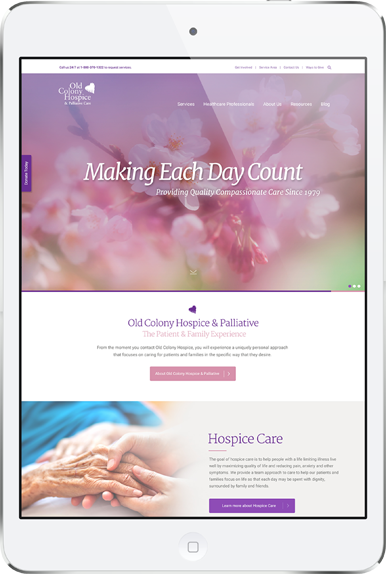 Since 1979, Old Colony Hospice has been at the forefront of hospice and palliative care. We provide the highest quality compassionate hospice and palliative care services to patients and their families all day, every day, year after year in over 50 cities and towns in Massachusetts. We are a free-standing, non-profit, Medicare certified, accredited healthcare organization that provides services through a core staff of registered nurses, social workers, counselors, volunteers and hospice aides and nutritional consultants. Area clinicians refer to Old Colony Hospice because they know we are a seasoned, hospice organization that will provide exceptional care to their patients. Old Colony Hospice is committed to continuing education so we can help you help your patients. Courses are designed to stimulate new thought processes and encourage dialogue. If you would like more information or wish to schedule a program at your facility, please contact us. Most programs offer contact hours for nurses and social workers, please ask when scheduling! Call us today to make a rapid referral at 781-341-4145. Please fill out the form below and we would be happy to give you more information about our services and answer any questions you may have.